What’s not to love about Australia Day? Top weather, a day off work and lots of special events planned to celebrate this national holiday. We’ve picked out the highlights you won’t want to miss. Join in the action at a beach near you where you can participate in an attempt to set a world record for the longest floating line of giant blow-up Havaianas. Register online to participate. This is the prime spot for a spectacular view of all the activities on the harbour, including the tall ships race, Ferrython, aerial demonstrations and the 21-gun salute. Bring a picnic blanket, relax and enjoy a delicious Aussie barbecue and entertainment. Located at Hickson Road Reserve, Dawes Point, from 11 a.m. until 3 p.m. If you’ve never experienced Australia Day in the heart of Sydney, it’s a must to add to your bucket list. A stunning light and multimedia show with a fireworks display to rival the annual New Year’s Eve celebrations kicks off at Cockle Bay from 7 p.m. This event will feature lots of free entertainment from top Australian musicians, flag raising, a 21-gun salute, aerial display and, of course, loads of fireworks from 10 a.m. until 7.30 p.m. Enjoy an Australia Day family celebration at Sutton’s Beach, Redcliffe, where there will be crab races, sandcastle building, food, refreshments, rides, thong throwing, stalls and buskers. NRL legend Darren Lockyer will also be there. From 10 a.m., Queensland’s Governor is opening Government House to the public. Step back in time with a guided tour, enjoy a picnic on the lawns and relax with free entertainment. Refreshments will be available to buy. Enjoy a family-friendly event on the NewQuay Promenade and Piazza with music, entertainment, backyard games, twilight markets, thong throwing, a giant sausage sizzle and fireworks over Victoria Harbour. All the action kicks off from 4 p.m. Celebrate Victoria’s diverse culture, history and rich heritage with the free annual Australia Day Parade. It starts at 11 a.m. from Swanston Street and will conclude at Kings Domain. From 3 p.m., there will be free attractions like mini golf, a giant slide, a bungee fun run, music, arts and crafts, fire twirling, magic shows and much more at the park located at the corner of Foster and Pultney Streets. Head on down to Commonwealth Park where there will be free entertainment, including a children’s concert and face painting, or wander down to Rond Terrace for flag raising and the citizenship ceremony. Enjoy a picnic on the shores of Lake Burley Griffin while taking in the sights and sounds, culminating in a huge fireworks display at 9 p.m. The National Museum has a free fun day out planned for the whole family, with hip-hop workshops, sing-a-longs with Yamba the Honey Ant and Jacinta from Yamba’s Playtime, and cuddle a scary critter from the reptile zoo. Kicks off at 10 a.m. until 2 p.m.
Elder Park will go off this year with big names in music taking to the stage, a street parade and a huge fireworks display. 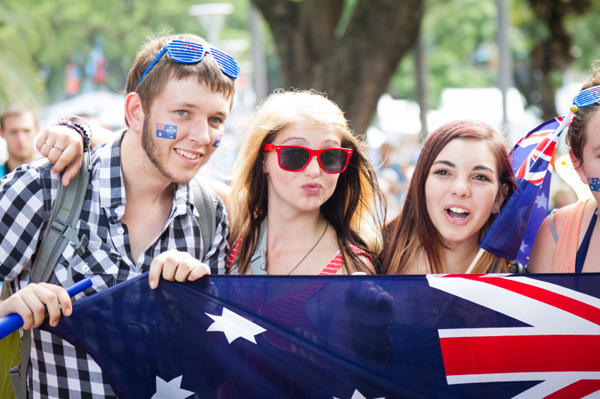 For more information, you can head on over to the official Australia Day in the City website. A spectacular water and lighting display will light up the skies of Perth. The premium viewing spot is Langley Park’s Entertainment Zone. Festivities start at 3 p.m and include an international food market, paint ball, a circus and a water playground, with the evening’s highlight exploding at 8 p.m.
Join in the annual festivities at Circular Head, including foot races, fishing competitions and cycling challenges with loads of entertainment and food. Celebrate our heritage at Bells Parade by trying archery, good old-fashioned whip cracking, sheaf tossing and egg throwing and cheer on the ferrets in the annual ferret race and fashion parade. Entry for adults is $8 and children enter for free.